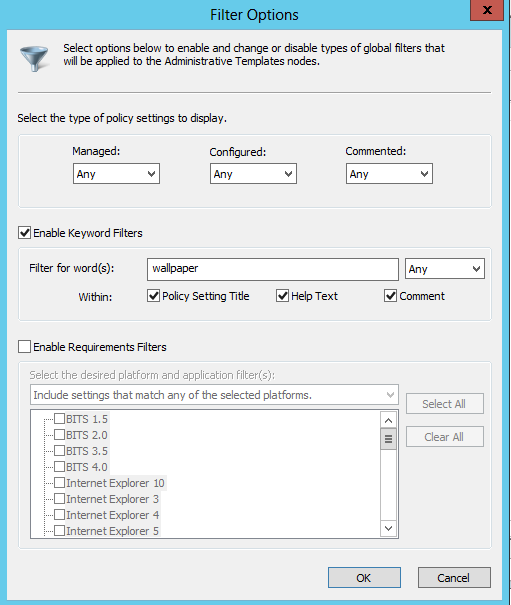 Today we’re looking at 3 easy ways to search Group Policy settings, primarily focusing on the Administrative Templates. With over 3000 settings (~3500 with Server 2012/Windows 8) you’re going to want to be aware of these methods! 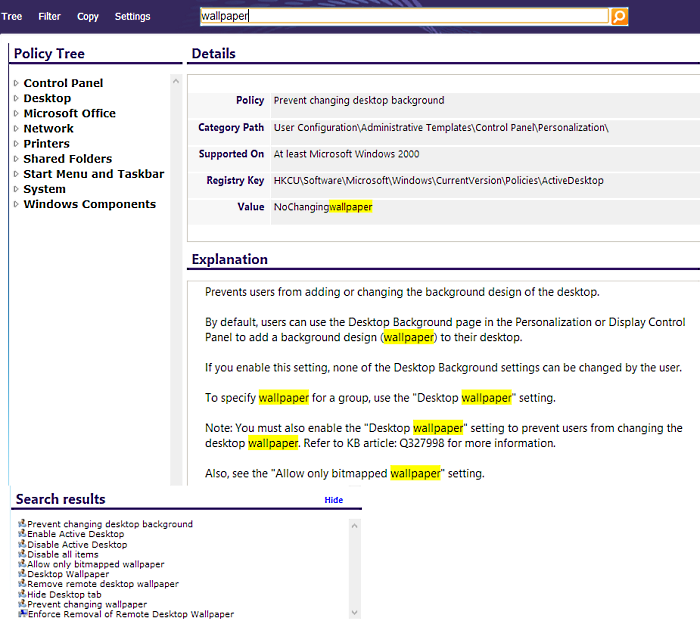 Microsoft put this site up a couple of years ago, initially at http://gps.cloudapp.net/, this has now changed to http://gpsearch.azurewebsites.net and will enable you to search any of the Computer or User Administrative Template settings within Group Policy. They’re also linking to a Windows Mobile Application for searching group policy, it’s nice to see they’re putting out apps like this: http://www.windowsphone.com/en-gb/store/app/group-policy-search/d1615909-62e2-df11-a844-00237de2db9e. You can search from within the GPMC MMC console itself by right clicking the Administrative Templates for the Computer or User segment and selecting filter options. The initial criteria is “any”, so you can simply type a keyword and filter the results based on that keyword, make sure you right click Administrative Templates and set the filter to “on”. The configured and commented options are quite interesting, I rarely see people commenting group policy objects or settings but this would allow you to only return commented or configured settings within a GPO. I really like the spreadsheets that Microsoft have provided for searching Group Policy: http://www.microsoft.com/en-au/download/details.aspx?id=25250; the filters in place make it very simple to filter out what you’re looking for. I particularly like the “Reboot required” and “Logoff required” columns, very helpful. These spreadsheets are well worth a look as they tend to give you a little more information than the methods above.